Three of the most common reasons people skip out on their checkups and cleanings are because they think they don’t have time, they are afraid it will hurt, or they think they are saving money by waiting just a little longer to go. Unfortunately, not visiting the dentist regularly can end up costing you more time, money, and comfort in the long run. That’s because what might have been detected early and treated conservatively will likely require a more significant, complex, and costly procedure if too much time passes — and that’s when you will certainly be regretting not making your oral health a priority earlier. A 6-month checkup and cleaning is a routine appointment that usually shouldn’t take more than an hour to complete. First, your hygienist will clean the surface of your teeth and around the gums, also checking for evidence of gum disease. Most people should also have a set of X-rays taken about once a year, so that may happen, too. Once it’s time for the checkup, your dentist will examine each and every one of your teeth for signs of cavities, malfunctioning dental work, and other oral health issues. 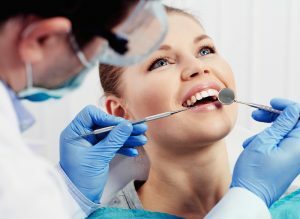 After the checkup and cleaning are complete, you and your dentist will have time to thoroughly discuss your oral health and any concerns you may have. Then, a follow-up appointment will be scheduled based on your oral health needs. Unless you require some kind of restorative treatment for a filling or any other issue, that will usually be in 6 months! It’s never too late to make your smile a priority once again! Even if you have fallen far off the wagon with your oral hygiene, you can always recommit by scheduling a checkup and cleaning with your family dentist this month. The important thing is that you are taking the right steps for your smile right now! Don’t wait to get in touch with your dentist — for the good of your oral and overall health. Market Heights Family Dental offers comprehensive dental care for patients of all ages. This team prioritizes prevention as a foundation of a healthy, lasting smile. To learn more about the need for preventive care or to schedule an appointment for a checkup and cleaning, please do not hesitate to get in touch with your dentist at 254-831-4329.